While I know spring technically started a good month ago, Michigan didn't really get the message until just recently. The days are finally warmer and it seemed about time to do a makeup regig and bring out some of my more seasonally appropriate bits. For base it's all about the SPF now that the sun is out and making its point. I'm a sucker for a light base most months, but it gets serious when the sun comes around. The two rivals in my collection are the bareMinerals Complexion Resuce and the IT Cosmetics Your Skin But Better CC+ Cream. Both are fairly similar in coverage and lasting power, but they lay slightly different on the skin. They're great for hotter days where you don't want too much makeup caked on your face, but still want a little something. It's these warmer days that really make it obvious just how pale I am, so I fake it with Soap and Glory's Solar Powder and some brighter blushes. 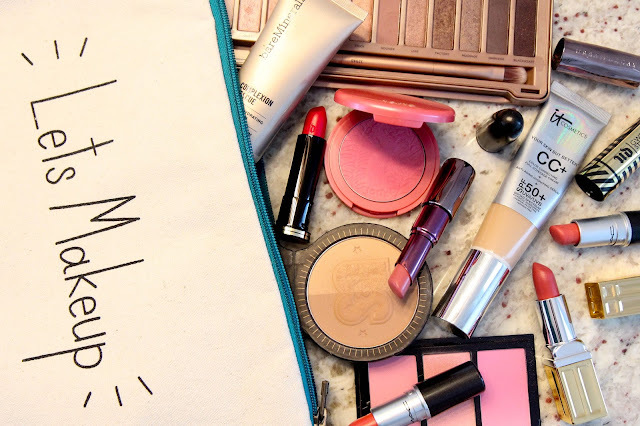 Tarte Cosmetics is an obvious blush choice any time of year, but Bobbi Brown has a few good, bright offerings as well. For eyes I'm all about rose gold lately and nothing does that better than the Urban Decay Naked 3 Palette. A lovely blend of shimmery and matte shades that all make me feel like a Greek goddess who just happens to be away from her gorgeous beach house. Lipstick is the easiest way to inject a little spring into a makeup routine and anything coral or pinky will do. Of course I tend to gravitate towards more natural looking shades like MAC's "Crosswires" or "See Sheer," Urban Decay's Revolution Lipstick in "Rush," and Elizabeth Arden's "Wildberry." If you're more of a brighter lipstick person, Urban Decay's Gwen Stefani Collab in "714" is a great orange-red matte shade with serious lasting power. So here's to warmer days and actually being able to go outside for longer than a few freezing seconds! How are you mixing up your makeup for spring?